Why am I providing a Jawbone UP24 review? Because I love it, and you will too. She told me she has been using a piece of wearable technology that had been a big help. Interested, I asked her about the device, how it worked, how easy it was to use, what she would do different if she did it again, etc. It seemed that this was something I could do too. I did my own research as well. I read comparisons online. I browsed Jawbone UP24 reviews on Amazon. And then I made my decision: I’d go with the UP 24 by Jawbone. Many other Jawbone UP24 reviews I read said the app that comes with the Jawbone is great. Not only was it good-looking and intuitive, but it also offered helpful insights. (After having used this for about 6months now, I’d have to agree with them. In fact, the insights are getting better with the more data I give the app). While some devices offered displays and other features that the Jawbone UP24 didn’t have, I figured that simple would be better. Who cares if the device tells me the time? I always have my phone on me anyway. Here’s something really cool, that I eventually discovered as well: I went on a trip to the mountains and had no cell signal. This frustrated me: I couldn’t check my steps! I had taken a big, long hike and wasn’t getting the credit due to me! It wasn’t until I returned to cell phone range that I realized that the Jawbone UP24 was holding on to a couple days worth of data for me! Speaking about access to the data, one Jawbone UP24 review said how important it is to have access to the data all the time. Some devices require an extra step to get at your information (such as plugging it in to your phone) so you might have to wait until the end of the day to see how well you did. You don’t want that. You really want the instant feedback of how many steps you’ve taken at that point in time. The Bluetooth connection to my phone from the UP24 model is exactly what I wanted. In fact, I’m amazed at the fact that my Jawbone UP24’s battery lasts about a week even though it is using Bluetooth. This is well-worth the extra cost over the regular Jawbone UP. The sleeping features are great. Once you tell the UP24 your going to sleep (simply by holding the single button down) it keeps track of how well you’re sleeping. This, by itself, is merely interesting. How you sleep, however, is connected with how much energy you have to exercise and how well you eat- so it has merit in a device with a goal of helping you become more healthy. The part I like best about this is that it will wake you up with a gentle vibrate every morning. In fact, it actually monitors your current sleep state to gently wake you when you’re only sleeping lightly- rather than abruptly when you’re in deep sleep. I was amazed at how much better I feel after being woken up in this way. I was excited to get my device and started using it the next day. That’s when I realized this was going to be hard work: you have to make an effort to get to 10,000 steps a day! I was somehow able to get 8,000 steps in my first day but didn’t know how I was going to be able to do that every day. In fact, the second day I was so tired I didn’t make it to 5,000 steps. I’ve noticed you’ve been getting about 4,500 steps a day, lately. Why not try to take it up a notch to 5,500 today? Would you like to try for this goal? With this “permission” to start with smaller goals, it didn’t take long to reach my goal on a regular basis. It does take extra effort to reach this. On an average day, at work, this means I have to take a walk during lunch and then another once I get home. I gauge how much I need to do when I get home based upon the feedback I get from the app. I have it setup to notify me every 2,000 steps and then tell me my total steps for the day at 5pm. If I had a particularly stagnant day in meetings (or just being lazy) that means I need to get on the treadmill and watch an episode of Firefly to finish up my steps for the day. This also affects the choices I make in my free time. My girlfriend and I have been spending a lot more time talking walks on the weekend. Sometimes we even reward ourselves by walking to our favorite restaurant, Pinkys Westside Grill. In fact one day, recently, I was literally on my way to her house in order to sit around and nerd-out with some programming when I realized, “it’s a gorgeous day. I should go for a hike.” I think this is often overlooked in most Jawbone UP24 reviews- the real value of this device comes from training yourself into a more active lifestyle. 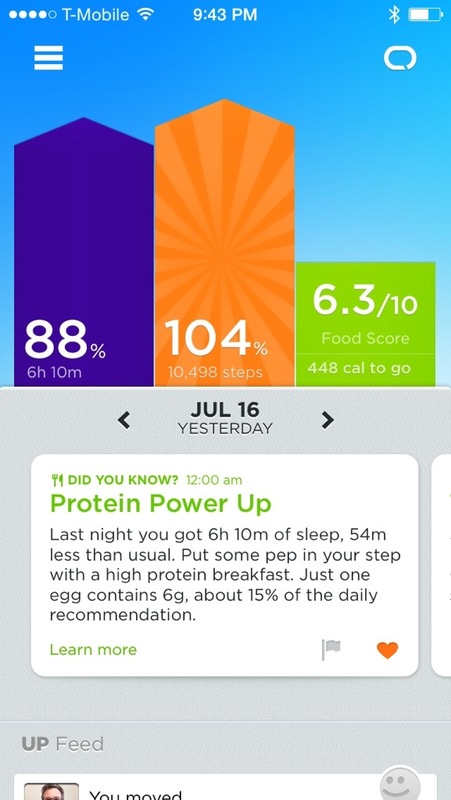 That’s the point of this device: it’s a way to measure how active you are. It’s not accurate like a pedometer. There are ways to cheat the system. It doesn’t track running very well nor swimming. That’s all okay. The Jawbone UP24 is about helping you become more active and facilitating healthy habits as a result. Sure, I’m healthier now than I used to be. It is much easier to get to my 10,000 steps than it used to be, for instance. This, however, only translated into a modest weight loss. My girlfriend’s friend lost a lot of weight doing this, but not me. That’s because she was counting calories, too. I’ve only recently started taking advantage of this feature (of the awesome app) but I’m already learning a lot about how I eat. Sure, it’s a little pain to always remember that I need to record what I eat. That’s kinda good, though, because it forces me to think before I stuff myself with those chips or down another Coke. I’m also learning about my diet. 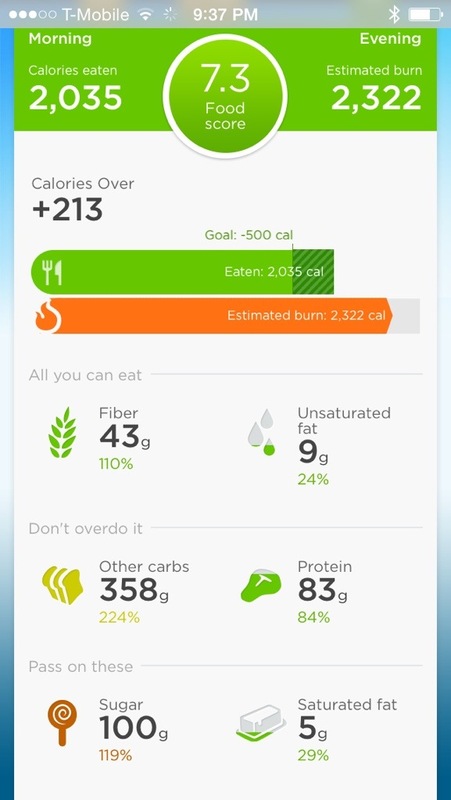 The app that accompanies the Jawbone UP also breaks down your diet into its components, telling you how much fiber you’ve eaten (and reminds you that you can eat as much of this as you want). It reminds you to be careful about how much carbs and protein you take-in. It also warns you about too much sugars and fat. This is much more helpful than the app telling you how many calories you’ve eaten. Just the other day the app was expanded further. You can tell it how much you weigh and set a goal for a new weight. It then tells you how many calories you should eat each day, based upon your activity recorded by the device, to achieve this weight loss. For instance, I need to eat 500 calories a day less than those I’m expending by walking in order to achieve my goal. That is some very helpful information. With the recent roll-out the app also gives your meals a number rating showing you how healthy they are. This means that meals low in sugar and bad fats (like the beans and rice I had for dinner tonight) are rated well but meals high in cholesterol and carbs (like the General Tso’s meal I had the other night) would be rated poorly. This is proving to be very helpful as I make decisions on what to eat in order to get my calories for the day. You know, collecting all these pieces of data have been very helpful. At first I thought they would make me feel guilty or like a failure. It turns out, that is not the case. These numbers help me gauge myself in an objective way. This results in me making better decisions. These decisions are resulting in a healthier life. And it’s kinda fun, too. It’s like I’m hacking my body. It’s like I’m hacking my life.